The Cisco® WAP200E Wireless-G Exterior Access Point (Figure 1) lets you connect Wireless-G (802.11g) or Wireless-B (802.11b) devices to your wired network, so you can add PCs to the network without the need for additional cabling. This weather-resistant access point creates a "wireless bubble" in exterior spaces, such as patios and outdoor cafés. Power over Ethernet (PoE) support makes it easy to install, and you can create multiple basic service set identifiers (BSSIDs) that connect to individual VLANs to keep your traffic separated. 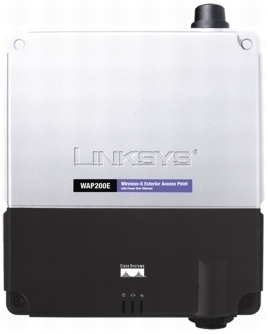 The Cisco WAP200E is also ideal for use as a bridge to connect remote areas. For example, it could be used to connect offices with a warehouse housed in a separate building, or to connect the buildings of a college campus. Installing one access point on each building provides connections at up to Wireless-G speeds - with no cable to run. The weather-resistant housing protects the access point and is lightning protected. To protect your data and privacy, the Cisco WAP200E supports both Wired Equivalent Privacy (WEP) and the industrial-strength wireless security of Wi-Fi Protected Access (WPA), encoding all of your wireless transmissions with powerful encryption. The MAC address filter lets you decide who can access your wireless network, and advanced logging keeps you apprised of access attempts. Configuration is a snap with the web browser-based configuration utility. RangeBooster technology, a compatible add-on to standard Wireless-G, can nearly double the range of your wireless network and increase its throughput by up to 35 percent. Unlike ordinary wireless technologies that are confused by signal reflections, RangeBooster uses two smart receivers at each end to detect and decode reflected signals at distances where standard technologies give up. You'll find that "dead spots" in the wireless coverage area are reduced as well. The integrated quality of service (QoS) features provide consistent voice and video quality on both the wired and wireless networks, enabling the deployment of business-quality voice over IP (VoIP) and video applications. Additional features such as multiple BSSIDs, wireless roaming, and auto-channel selection make the Cisco WAP200E ideal for your business.